The man who in the Providence of God is called to move from place to place finds himself in very different circumstances; he is constantly pulling up his roots, which is a painful process, and undertaking the task of transplanting, which is often a critical one. Unless he has root in himself, the loss of the social and religious buttresses which are often indispensable conditions of stability, will prove fatal. This is why so many people, in moving to a new place, drift away from all religious associations. Denominational attachments are thus often loosened and finally destroyed. The man who moves from place to place must be a firm Christian and a loyal denominationalist if he is not to suffer. Fresh beginnings no doubt have their advantages, but to some temperaments it is terribly disheartening to have to leave a field to which much toil and thought and precious seed have been given, and start on strange and new ground. When we find a man who in spite of these difficulties maintains and develops his religious life, retains his denominational attachments, and amid fresh woods and pastures new keeps his enthusiasm in perennial freshness, we feel that there must be in him a good deal of grit and grace, to say nothing of gumption. It is of such a man we write. 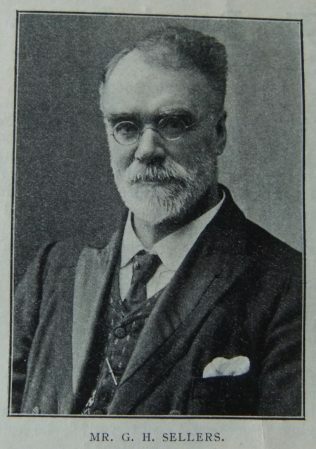 Methodist. He was born in Sheffield, March 18th,1850. Converted when seventeen at Kilnworth, in Rotherham Circuit, he forthwith devoted himself to school, band of hope, cottage prayer meetings, and mission work. His speaking gifts were soon recognised, and in 1867 he began to accompany Mr. George Lee to his appointments. He soon became a fluent and effective speaker, and in all his varied spheres of service has done useful work in this connection. Whenever his Assurance Company has transferred him to a new locality he has made it a point to find a residence near a Primitive Methodist chapel, and with him godliness has been profitable both for things spiritual and temporal. Essentially a man of action, energetic and persevering; his company made him a superintendent and have found him a valuable servant. He has held many offices in our church: Class leader, Society steward, trustee, treasurer, and Circuit steward. A member of District Committee, and General Committee, he has been several times a delegate to District meeting and Conference. While a devoted Primitive Methodist, Mr. Sellers has given himself with whole-hearted abandon to many forms of service. A life-long abstainer and non-smoker, the temperance cause has found in him an able advocate. A loyal Free Churchman, he has been an earnest worker in association with Free Church Councils. In municipal affairs he is wide a wake, and on occasion will do it good stroke of work. Then what a thorough Liberal he is! How he rejoices in the triumph of the cause! How he toils for its advancement! How righteously indignant he is with its enemies! In him social and progressive movements have a friend and helper. He is a good man, an able preacher, and devotes his time, his talents, and his service to the advancement of the Kingdom of God. It is a great joy to him that he has been permitted to give his son, the Rev. Ezra Sellers to the ministry of the Church he loves. May he and his devoted wife have yet many happy and prosperous years. George was born in Sheffield, Yorkshire, to parents George and Mary. George, senior, was a coal miner. Census returns give the following occupations for George. 1911 superintendent, Royal London Mutual Assurance Co. Ltd.
George married Elizabeth Alice Chadwick (1849-1892) in late 1871 at Doncaster Yorkshire. Census returns identify five children. George married Martha Atkinson (abt1845-1927) in early 1896 at Hull, Yorkshire. George died on 2 March 1917 at Wandsworth, London. Note: Census returns suggest a birth year for Martha Atkinson of abt 1845; death record gives estimated birth year as 1838.